There is no better way to jump into classic watch collecting than with the Seiko classics. These movements – and watches – come in multiple forms and flavors with different complications and cases. Based on Seiko’s workhorse base movement, these watches have been running consistently and constantly since the the 1960s and are still available online for a pittance. The first movement we’ll discuss is the 6309 line. This is a basic movement and was launched in 1976 and discontinued in 1988. 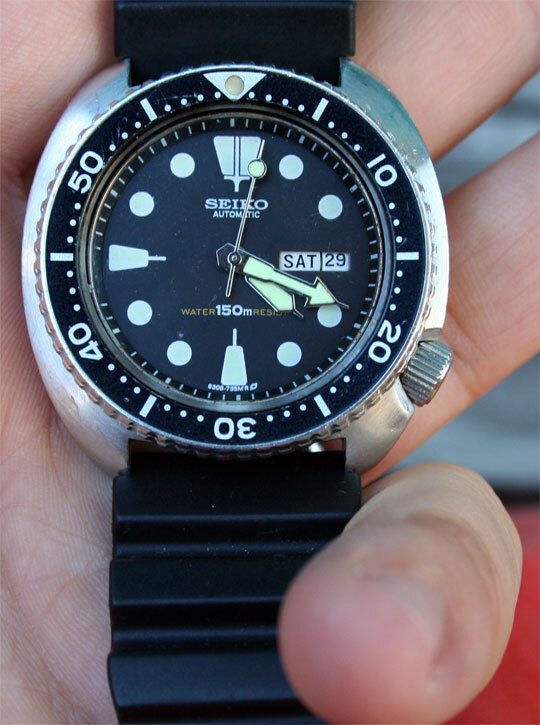 It was designed to fit inside the cushion case of the 6309 line of divers but also appeared in the Seiko Sport 5 line that was less water resistant. The movement has 17 jewels and is completely automatic with a half rotor taking up most of the visible surface and a non-hacking day/date movement. Whoa, you’re saying. What the hell are you talking about? Here’s a quick explanation. The 6309 movement is a base movement with a rotor, the little thing that spins when the watch is in motion. It drives the mainspring which in turn drives the balance wheel. This drives the hands and the day/date mechanism. This movement has 17 jewels, tiny rubies that reduce friction within the system. Because this is a mass-market movement, Seiko focused on durability and not on aesthetics. This movement is so plain as to be boring, but up close, if you dare open the case, it’s quite striking. I won’t open the cases on these because you’re essentially seeing what’s going on via the face and I’m definitely not qualified to dig into these guys any further. The next movement is the ubiquitous 6139 chrono movement with day/date and a single thirty minute register at 6 o’clock. 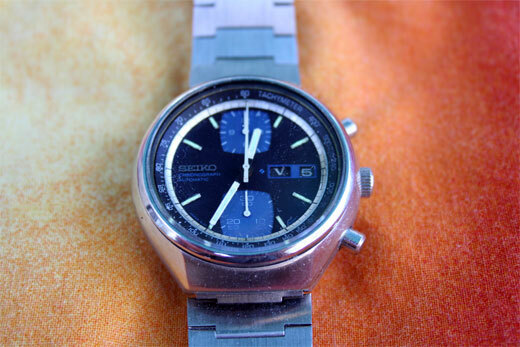 This is probably the second most popular Seiko model in existence, after the 6309 and her newer successors. 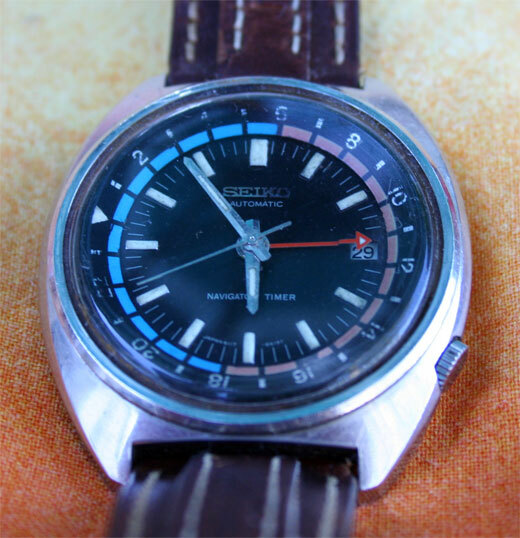 Unfortunately, Seiko completely stopped making automatic chrono movements – except for a few rare exceptions – and this series is now fairly collectable if kind of silly. The 6139 is essentially a single register chrono that lets you measure increments of a half-hour with any accuracy. They came in multiple casings, from the waterproof Seiko Sport 5 and Speed-Timer series to that plain old “Automatic” series that came out at the end of its run. The 6139 is one of the first automatic chronograph movements ever created and ranks up there with the El Primero movement by Zentith/Movado. 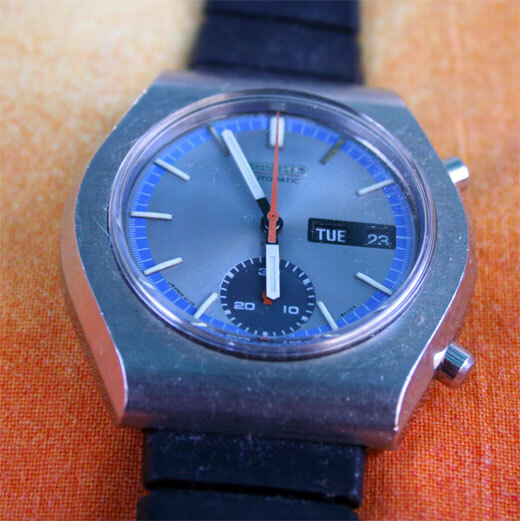 Like Swatch, Seiko stuffed their movements into multiple oddly-colored case and face permutations, leading to a plethora of odd shapes and sizes including models with an internal rotating bezel. It does not have an independent constant seconds hand and the only time the face is ever moving – aside from the hour and minute hands – is when the chrono is engaged. The model you see here is a 6139-8029 from about 1975. The chrono movement is integrated into the main power train so it is about as thick as the 6309. The top button starts and pauses the chrono and the bottom button resets it. This particular movement had a catch in the minutes register which would stop the movement completely when it tried to advance one minute. I had to send it into the Seiko service shop where they cleaned it up considerably. One strange aspect of this movement is the quickset date. To set the day, you push the crown in all the way until it flips. Then, to set the day, you press it a bit more gently. The best way to set this movement is to advance to the day before the current date and then swing the hands around once to have the entire movement advance by one day. This particular model has a miniscule crown that is actually quite a pain to handle, but since you rarely need to reset the date or the time, it’s acceptable. The 6139 is a historical movement and available almost everywhere. The 6138 is its rare younger brother, an oddly named chrono movement – the 6139 came out before the 6138, right? – that also features an hours register and an improved quick-set day date. The first thing you’ll notice is the thickness of this movement, even in a non-waterproof case. This guy is a monster. It has two registers, hours and minutes, and is almost a half-inch thick. This particular model is a 6138-8030 and has a handwind feature which means you can wind it independently of the automatic movement as well as an improved day/date setting mechanism. The crown does not push in on this model. Instead, you pull it out halfway and turn it up to set the date and down to set the day. This method is considerably more common in today’s watches but was quite a departure when this movement first hit the market in the 1970s. Size aside, I prefer this movement over the 6139, but it is quite rare and quite hefty. Finding a piece in good working condition is fairly hard, but not impossible. The last classic we’ll discuss is the odd 6117-6410. This is a similar movement to the 6309 except that it has a date register and a third 24-hour hand calibrated to the main hour hand and an inner bezel. 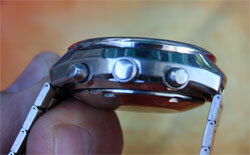 The inner bezel is if or setting the time zone and is turnable when the crown is closed. At halfway, the crown controls the date register and at full extension it controls the time. Clearly, this is a one-off movement of some import. 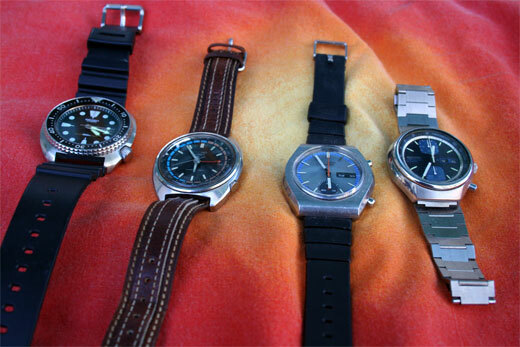 Seiko has not been big on GMT pieces until recently and most of those have been quartz. This is an automatic GMT, called the Navigator Timer, that can show two timezones simultaneously. This is an extremely rare bird and the model I found is just barely running. It is an oddity in this cavalcade of classics and comes from the 1970s. Clearly this is a just a brief overview on the majesty of Seiko classics, but I felt it was important enough to share with you all. I collected all of these auto movements over the past year or so and wanted to really get in depth with each one, but that’s for another day when I’m not swamped. Until then, happy watch hunting.